North of the Spanish border in an area knows as French Catalonia, lies the Mediterranean town of Banyuls. 1981, Vincent Cantié and Christine Campadieu took over two small, family-owned domaines and planted vineyards on steep, schist terraces overlooking the sea. Here the vines are exposed to the fierce wind known as “La Tramontagne” whose influence ensures low yields and also keeps the grapes free of mildew so there is no need for pesticides. Viticulture is a challenge in this landscape, but well worth the effort! 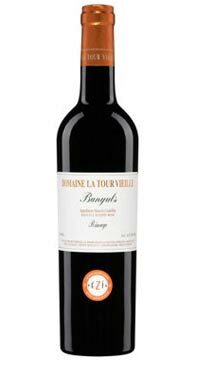 The Banyuls is 90% Grenache and 10% Carignan. Neutral grape spirit is added during fermentation, arresting the conversion of sugar to alcohol and increasing the sweet juice to 16% alcohol. The wine has about 90g/L of residual sugar. It is is bottled within the first year of ageing, so it is not an oxidized style. This is the perfect wine for chocolates and chocolate based desserts.